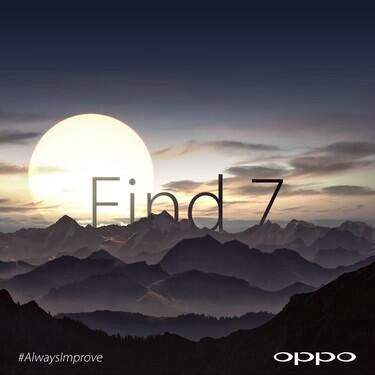 Oppo has started teasing their next flagship phone, the Oppo Find 7, there is no official details yet, but the rumored specs looks really good. If they can have such small bezels as the LG G2 has around the 5.7-inch large display, then I don’t think the Find 7 will be too big to handle. The rumors says that the Oppo Find 7 will have the latest Snapdragon 805 processor from Qualcomm, 3GB of RAM memory, 5.7-inch 2560×1440 (2k) display, 13 megapixel rear camera, 5 megapixel front camera, 4G LTE and a 4,000mAh battery. The 4G LTE was what the Oppo N1 lacked, so that is a huge plus. I wish it would come with CyanogenMod as an option too. We will see about that. Hopefully it will launch in time to steal the spotlight from Samsung and HTC’s coming flagship phones. Update: Carl Pei, International Markets Manager at Oppo says: “Rest assured guys, the Find 7 will not have a 5.7” or 7“ display”, so there you go, you now no longer need to be worried that the Oppo Find 7 will have a too large display.